Still haven't got my box?? The contents of the box was of good quality and I was happy with it. Sadly I made a mistake when ordering for the tshirt size. Selected kids xs instead of kids large. So you may have realised this was for a child and I emailed to ask if there was anything I could do to exchange for the correct size. No reply. If they had even taken the time to say there was nothing I could do that would have been fair, it was my mistake, but to be ignored. Not acceptable in this day and age. So if you want to give money to a company that doesn't respect you or your kids then I would recommend this one. I was going to say how I really felt but had to reconsider, I'll just say I'm very unhappy with the shipping 2 days before the month is over and still no box. But thanks to people spoiling it I know what's in it so thanks!!! Love the concept and was pleased with the contents overall. However when choosing to receive random houses monthly I didn’t expect to continuously get the same house every month. Second gripe was delivery. When I didn’t receive the box one month it literally took a month to get a response and a new box sent out. So long in fact that the following months box arrived less than a week later. Finally they didn’t enclose the card I opted for as it was a well done gift. So the box went to its recepient without any explanation or knowing who it was from. The child’s XL T Shirts also come up tiny. No way age 12-14. It’s a shame but for these reasons I cancelled our subscription. 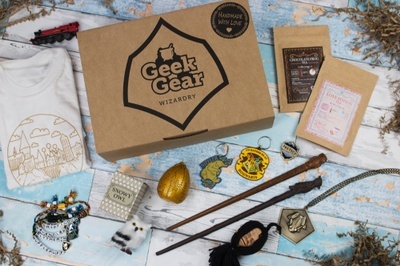 The box I received last month had a Platform 9 3/4 sign which is supposed to be coloured red and gold according to the mini-catalog they include and other websites that sell the similar product. The colour was WAY off, with the middle section (which is supposed to be gold) being almost the same red colour as the outer section. It definitely looks like a printing error and I don't want to hang it up because it looks off and is very difficult to read from a distance. When I contacted them to request a replacement they said simply that "each sign varies in colour" and denied the request. I have cancelled my subscription for the time being. Overall the quality and quantity of products is great (this was the third of three boxes I ordered) but their reluctance to correct the mistake was very off-putting. I recently posted a review....I am updating saying I have received my other box a bit ago. Even though they're reply to my emails were very late, they did reply after I got my box, and we settled any further needs. Still great things, I will just order my subscription manually instead of auto.